Beautiful uncancelled certificate #3 from the Tattersall's (of Chicago) Limited issued in 1891. This historic document has a vignette of a horse's head. This item has the signatures of the Company's Directors, Baldron Hodge and Secretary and is over 118 years old. This is the first time we have seen this certificate for sale and believe it to be quite rare. The certificate was issued to the Honorable John Ashburnham. Tattersalls (formerly spelled with an apostrophe) is the main auctioneer of race horses in the United Kingdom and the Republic of Ireland. It was founded in 1766 by Richard Tattersall (1724-1795). 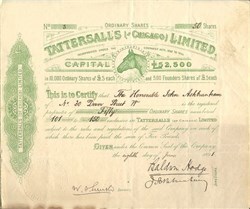 Tattersall's (of Chicago) Limited was a new venture of the United Kingdom Tattersalls in the United States. 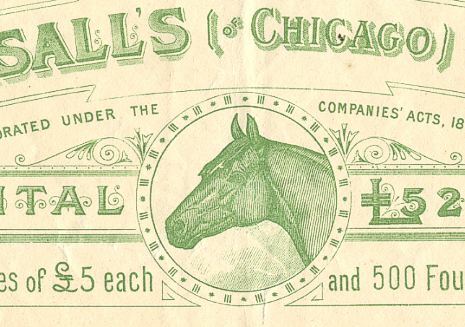 Tattersalls, for many years was one of the most prominent structures of the city of Chicago. It was erected in 1891 at a cost of $300,000 by the Chicago American Horse Exchange, representing English capital for the greater part, and the purpose was to make it a great horse exchange, similar to Tattersalls .